I am not opposed to supplements. However, I do find myself increasingly critical of the heavy reliance often placed on them. The more I read, the more I realize how little most of us (myself included) know about our supplements. For instance, health gurus are urging us to take astaxanthin, the latest miracle antioxidant. On some level, most of us know that it probably takes some doing to get astaxanthin into a capsule but most of us have no idea where it actually comes from. The answer: Some astaxanthin is carbon dioxide extracted from algae. 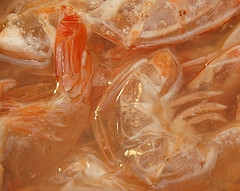 Some is extracted from “shrimp waste” using hexane and/or acetone di-ethylamine. That shrimp waste comes from . . . well, it is difficult to learn where it comes from. A shrimp farm in Thailand? A shrimp packing factory in Louisiana? Although those of us taking supplements are often as concerned about the health of the world as we are about our own health, we usually do not know whether the supplements we are taking, the factories the supplements are made in, and the raw materials they are made from are sustainable. I am just beginning to explore this world supplement manufacturing but I am already convinced that, while supplements may have their place, they are without question a poor substitute for real, whole food. To me it is definitional: To supplement means to “add to.” Supplements should always be an addition to a healthy diet, not a cure for an imbalanced diet. For instance, consider lung cancer: As we discuss in class, smokers who eat a lot of fruits and vegetables are more protected from lung cancer than non-smokers who do not eat fruits and vegetables. People who eat lots of fruits and vegetables have less cardiovascular disease than people who do not. However, when science attempts to pinpoint why — what in the vegetables and fruits is conferring this incredible benefit — their studies fail to come up with the answer. Smokers taking a beta-carotene supplement (an antioxidant found in vegetables such as carrots) have a higher rate of lung cancer than those not taking a supplement. Men taking a vitamin E supplement, a heart protective antioxidant, have more heart problems than those not taking the supplement. Women taking a multi-vitamin reportedly have a higher mortality rate than those who do not. The latest study showing the synergy of whole foods – meaning the value of real, whole foods is greater than the sum of the parts in that food – compared fish and fish oil capsules. Many of us take fish oil capsules to rebalance our ratio of omega 6:3 fats, a ratio thrown off by poor eating habits. Instead of moderating our grain and vegetable oil intake and making sure our diet includes omega 3–rich foods, we turn to fish oil capsules. Many, if not most, of these capsules contain fish oil made from small fish like Menhaden. While there is a serious debate about this, some say our fish oil use is rapidly depleting the stores of small fish that our wild fish need to survive. In other words, our fish oil consumption may be unsustainable. Moreover, these capsules are not as effective as simply eating some fish now and again. We could achieve the same benefits using less fish if we ate fish rather than fish oil capsules. In a recent study, healthy adults were variously fed fish (about 3 ounces/day) or given fish oil capsules (1 or 3 capsules per day). Each capsule contained 150 mg EPA and 106 mg DHA. (EPA and DHA are two long chain omega-3 fats we want from fish.) The levels of these fats were also measured in the study volunteers two weeks before the treatment started, before beginning the regimen, and at week 6. Blood levels of the beneficial omega-3 fats quickly rose to much higher levels in those eating fish. Researchers estimated that it would take more than twice the amount of EPA (800 mg) and 9 times the amount of DHA (4500 mg) in the form of fish oil capsules to achieve the results seen in those eating fish. In other words, fish delivers the good omega-3 fats we want much, much more efficiently than fish oil does. Ultimately, simply eating real fish, even infrequently and in small amounts, is much better than regularly taking fish capsules. (This is especially true as there are indications that taking more than 1 or 2 grams of fish oil per day begins to deplete vitamin E stores, creating a different set of problems that does not occur in those eating fish.) In fact, someone trying to raise their DHA levels could do so simply by eating no more than 2/3 of an ounce of salmon a day. Salmon filets are often available at $6.99/pound. That translates to about three weeks worth of omega 3 fats for $6.99, less expensive than fish oil and with the important side benefit: You are not participating in perhaps depleting important food sources for our wild fish. This entry was posted in antioxidants, Food, supplements, Uncategorized and tagged astaxanthin, beta carotene supplements, DHA, EPA, fish, fish oil, shrimp, whole food. Bookmark the permalink. I am told to take fish oil due to epileptic seizures. And because I don’t eat anything so regularly as every day. No way I could eat salmon daily. This would leat to me disliking salmon. I do love fish being Portugese from an island. So I also forget to take the capsule daily. I am not sure either if oil for my condition really works or helps my condition. So I don’t really know. Am 53yrs young, and had condition since age 37. I am working on eating healhy and not too much at one time. Anyone with this condition? know what foods are good for it? There is no need to eat only salmon. You get omega 3s from other fish such as sardines and herrings. In this study, people got the same increase in blood fats eating 1/3 to 2/3 an ounce of salmon a day. In a week, that only amounts to 2-5 ounces of fish a week. That is not a large amount and the researchers seemed to think that eating fish regularly would suffice rather than every day. As for foods for various conditions, that is a bit beyond the scope of this blog. I just came across your blog and your eating plan and am fascinated by both! My initial question is this: how does one prepare (& eat) just 2/3 of an ounce of fish? How much is that? A tablespoon? More? Do you have any helpful guidelines for people like me who need something more specific to go by, like “the size of your fist”. Thanks! I think what they are recommending is not that we eat infiniteisimal amounts on a daily basis but instead have fish one or so a week. So instead of 1/3 – 2/3 ounce/day, you would eat at least 2-4 ounces a week instead of taking fish oil capsules. They did not look at the pros and cons of eating a bit more each week, which most of us would with a serving of salmon probably being what, 6 ounces? Less if we are going for sardines or herring. Hi Kathy, nice post. Can you say a word about farmed fish vs. wild fish, and what fish are safer than others? How about cold pressed organic flax or hemp seed oil as food, as they are far less processed than fish oil? Thanks! Diet is what determines how rich something is in omega 3s. Farmed fish are usually not fed an appropriate diet and tend to be very high in omega-6s and other things you neither need nor want. When fed a more natural diet, they tend to be very unsustainable. I am not a fan of farmed fish. In terms of flax versus fish and their effects on our omega status, that probably could fill a book and will be a topic of a future post. A brief summary of my position: In a well-balanced diet, flax will work as well as fish. Dear Kathy, Another aspect of the fish oil debate is the efficacy of prescription fish oil vs. over-the-counter fish oil. Hard to know how much of the push toward fish oil supplements is commercially driven. I wrote about the confusion the fish oil debate causes health-conscious individuals on my blog Slice of Mid-Life in an entry entitled The Last Word on Fish Oil. Clearly, that wasn’t the last word, as your blog had much useful information on the subject. Glad I found this entry and your blog. I am looking forward to reading more. It is really interesting material, isn’t it. I listen to Swedish radio in the mornings and they have been presenting a lot of information on toxins in fish globally; really interesting – albeit a bit disheartening material. My naturopath thought that I needed to take pure fish oil capsules that need to be refrigerated rather than the Costco brand which she said is not good quality and not pure. I have been taking Norwegian Fish Oil Capsules which the label says is a concentrate of fish body oils from deep, cold water fish. I was recently in Juneau and purchased “Salmon Oil” Capsules which the label says is 100% Wild Alaskan Salmon Fish Oil. Besides the good cardiovascular health I have been advised to take 2000mg fish oil capsules daily for depression and menopause hot flashes. I have just increased my dosage from 1000mg so no clear results yet. But my main question was do you think the “Wild Salmon Oil” Capsules might be a better product than just “fish oil”? If I don’t see any results at the end of my current supply I may try your idea about just including fish in my diet weekly. I think that I already do this but I will be more conscientious. After years of taking 1000mg fish oil capsules/day I have seen no improvement in my cholesterol levels. If I were to take fish oil, I would take a fish oil from wild caught Alaskan salmon – at least for now. I think I would rather eat some good fish than take a high dose fish oil capsule, however. One advantage to living in the Pacific NW. Sometimes wild salmon is very inexpensive — this week King salmon was $13/lb. Trader Joe’s often has frozen. But even at a higher price, wild salmon is a better choice than fish oil in capsules.